According to the Venerable Bede who lived in the 8th century the name Easter derived from the name of a pagan goddess, Eostre. She was goddess of Spring and fertility and her festival was celebrated at the Spring Equinox. Jesus was crucified in April and when the Saxons became Christians they began to celebrate his death and resurrection early in the Spring but they kept the old name Easter. Alternatively it has been suggested that Easter comes from the Saxon word for dawn. In the early years of Christianity there was a dispute over the date of Easter. In 325 the Nicean Council decided it should be on the first Sunday after the full moon after the Spring Equinox. That is why the date of Easter changes each year. Friday is the day of the week when the crucifixion took place. It is called Good Friday because good meant holy. On that day we eat hot cross buns. (Good meant holy). The origins of hot cross buns are obscure but in pagan times people baked buns and offered them to the gods. Cross buns with the cross representing the cross of Jesus were first mentioned in the 18th century. In the early 19th century people sold hot cross buns in the street from stalls and so they became known as ‘hot’ cross buns. The Easter bunny was originally a hare because hares were fertility symbols in the pagan religion and they continued to be associated with Easter after people were converted to Christianity. Because people in the USA were unfamiliar with hares the Easter hare became a rabbit. In the Middle Ages Christians were forbidden to eat eggs during Lent (the forty days before Easter). Not surprisingly people were keen to eat eggs when Easter arrived! Some people also said that the egg represented the tomb of Jesus, or it represented the stone that was placed over the entrance of his tomb and was rolled away when he rose from the dead. (Long before Christianity eggs were a pagan symbol of fertility). 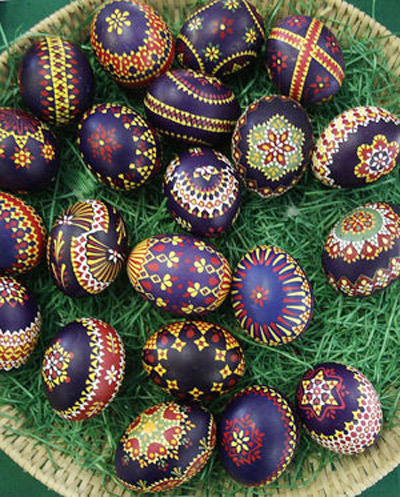 In the Middle Ages people painted Easter eggs red but by the 18th century people bought artificial eggs made of various materials to give as gifts at Easter. (Sometimes the artificial eggs contained gifts). Chocolate Easter eggs were first made in the 19th century. An excellent post, thank you. Makes easter far more interesting. Though here of course easter falls in Autumn!